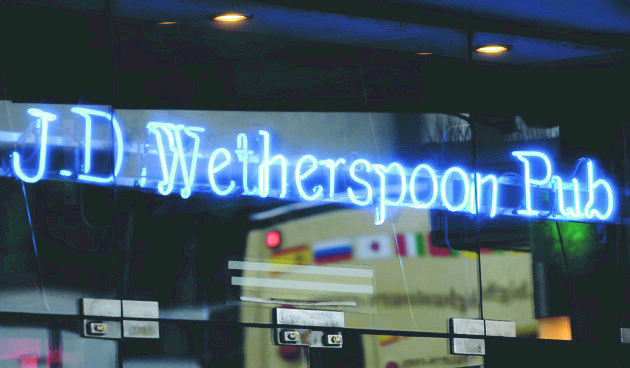 On 27 January, an initiative called Spoons Workers Against Brexit was launched, calling on the Wetherspoons pub chain to remove the in-store propaganda for a no deal Brexit. Deliveroo riders in Bristol will strike on Friday 18 January, demanding higher pay and other demands which managers have repeatedly ignored. This follows a national courier strike on October 4, and a spontaneous strike in Bristol on December 11, which brought Bristol Deliveroo to a standstill. 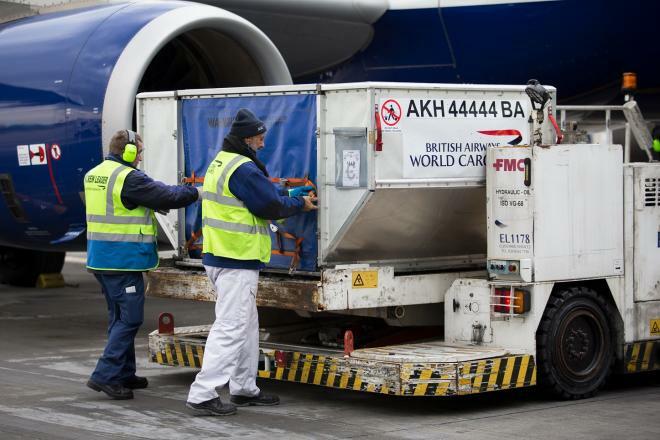 On Tuesday 27 November 2018 over 100 Unite the Union reps from cargo handling, cabin crew, catering, cleaning, engineering, security, baggage handling and the fire service along with some Unite officers and organisers packed into a committee room in the House of Commons for the launch of a campaign across four major airports. Two train drivers talked with Solidarity about the latest in the long-running Driver Only Operation dispute, where the RMT union is taking action against threats to guards’ jobs. As far as we know, the Merseyrail offer is not final. We’re not even sure why it’s been publicly released. Negotiations are still ongoing. The ACAS process was supposed to be confidential, and this breaches that. Last week we reported the wildcat strike by workers at the “community owned” Ivy House pub in South London, members of the Bakers’ Union. In this case “community owned” meant more “Big Society” than “workers’ control”. Shortly after the last Solidarity went to press on Tuesday 2 October, the Ivy House workers, who had kept the pub shut down completely for three days, won completely. The union is recognised, zero hours contracts will be replaced by fixed hours ones, and the four sacked workers are reinstated with back pay until a disciplinary process has ended. Fight for £10 and union rights! Workers from McDonalds, Wetherspoons and TGI Fridays all took part in an international co-ordinated day of action for £10 per hour and union rights on Thursday 4 October. In London they were joined by Deliveroo and Uber Eats riders, and supporters from across the labour movement. At their rally and demonstration in Leicester Square they were joined by traffic wardens in Camden Unison, who are also currently on strike for a £11.15 an hour. Solidarity action took place in cities across the UK. The first Wetherspoons strike was also coordinated from two sites in Brighton. Read more about Fight for £10 and union rights! Workers at The Bright Helm and The Post & Telegraph Wetherspoon’s pubs in Brighton are being balloted for strikes for union recognition and a £10 an hour wage by the Bakers, Food and Allied Workers′ Union (BFAWU). 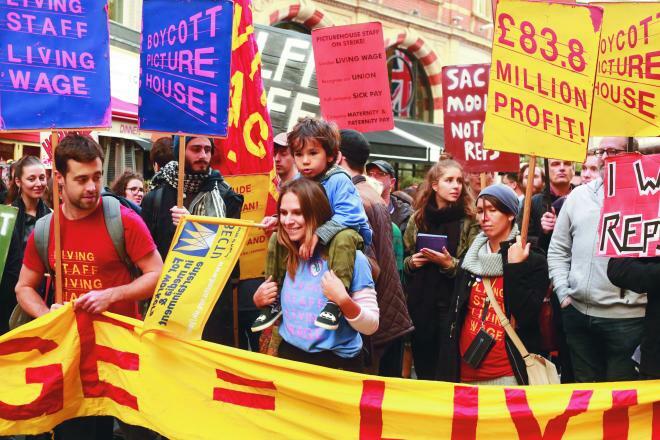 Picturehouse workers will be on strike again for the Sundance film festival happening at Picturehouse Central from 31 May to 3 June. They will be striking during the opening night on Thursday 31 May, and again on Saturday 2 May. The strikes will hit several premières taking place at the festival. Workers will hold picket lines from 17:30-20:30 each night, and welcome supporters to join them.